All in all two nice weeks. Dammit, I missed the Christmas-post. But it wasn't really my fault because my hoster made some changes to their environment which caused my blogging software to refuse any connection-attempt. But after a support-ticket they quickly resolved my issue, sadly it was to late for my Christmas-post. So I hope you all had a nice Christmas. 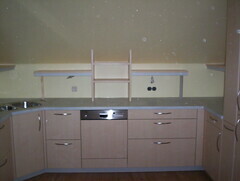 Ok, as promised here I'm presenting pictures from our kitchen after it has arrived. These were taken on October 6th, immediately after the carpenters have finished their last screw. Even dust particles are still floating around and visible on the images. The cables for light installations are still hanging out and only a few sockets are already mounted. 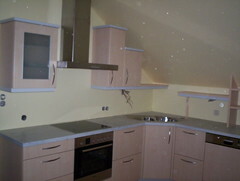 On the first one (kitchen_left) you see the left side of the room starring the cooking and baking area. Nice feature of the stove are an alarm and automatic turn-off timer as well as sliding arms for the baking trays. The ceramic stove top is incredible. The hot plates are hot after three seconds latest, timed with my (afterwards burnt) palm. The hood is also equipped with auto-turnoff-timers. The sink is nothing special, perhaps to note that it's an enlarged corner-sink. Below the sink is a rotateable waste- cleaning-stuff-storage system with several pull-out buckets for separating waste and keeping cleaning equipment together. The middle part (kitchen_middle) features the AAA dishwasher and a customized shelf handmade by our carpenters. The diswasher is again equipped with all sorts of automatic stuff like start-timer, electronic measurements of salt- and rinse aid-status and automatic detection of how dirty the dishes are (including clean-water recycling from the last run). As said above the surface on this side has extended depth and the drawers are jumbo-sized too. The drawer on the right bottom can hold more than two trays of beer. 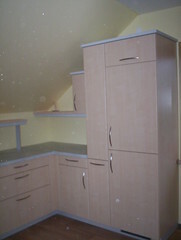 And on the right side (kitchen_right) there is our star: a full-sized pull-out pantry. This one commonly causes "Wow"s from visitors. Next to it the fridge and freezer. Nothing very special there, only automatic de-iceing and antibacterial surface-coating inside. On the very right border of the image there are a few milimeters of the window visible. We had to cut the window sill on the left side so that the cabinet for fridge and freezer could be placed flat on the wall. Just a few moments of fun with the angle grinder. Well that's been the look from late October. Today it looks even better since almost all furniture is ready and the other equipment is there. CookingByNumbers.com is finally something I've been searching for for ages. Well, at least since we have our own kitchen ready. And while I'm at it I noticed that I didn't post when our kitchen was finally finished. I did post when we had painted the room but never when everything was installed. I'll put that on my todo-list. Take care, that you choose a girl which only sporadically shows her 'love' to the boyfriend when people are around. The boy should be one of those who are 'orbiting' around their girlfriend most of the time. It also aids the fun if both of them are a bit stubborn. Mix all of them together in an environment of a mead tasting event and let them rest for a few hours. You'll notice that after some time the mixture begins to sparkle and fizzle around. Dark thunder-clouds can appear on opposing sides of the bunch and somehow a strange separation of the ingredients occours. This can either be followed by a series of small explosions or a surprising silence and peaceful reunification of the trimmings. The later the evening and the higher the alcohol-niveau the faster and reactive the reactions become. Take care, that under no circumstances you end up between two or more of the parts. Always secure your neutral position! Stay out of range! The joy in the whole procedure lies not in waiting for the final result, at least not only, but in trying to predict the upcoming actions and reactions of the different parts. It's also possible to initiate some betting if you have some additional surveyors with you. It can be much fun too discussing why somebody has reacted to something in the way he or she did. From time to time there will be periods of silence or peace, but if the ingredients are well-chosen, reactions will spontaneously re-initiate on their own. In the meantime you'll have to have fun in another way but that shouldn't be a large problem. Later in the evening (perhaps even the next morning is approaching) if the steady flow of alcoholic fluids has sustained reactions will become more uncoordinated and sometimes people will not even react to actions. The whole thing gets more unpredictable and attacks have probability to jump over from the vocal to the physical stage. For some people this level is also entertaining but for this is the time when I begin to take some care and keep an eye on the parts to keep them from hurting themselves or creating too much damage. It's not uncommon for me to jump the train at this stage and bring the evening to a nice ending. Well, nice at least for me when I have the confidence that no one was physically hurt and everyone is safe for the rest of the night. Sometimes somebody escapes and vanishes in the night. This is annoying but unchangeable and surely something I can live with. After all, everyone is responsible for his own actions even if I'm trying to take some care on them. I escaped the Submachine (from Download Squad) in roughly 12-14 minutes. It's a little point'n'click/drag'n'drop game. Seems that Download Squad is becoming my primary source for filling up my waiting-for-something-complete cycles. I'm wondering if a Joule Thief somehow can aid me in my plans of building LED illumination. Many other Google hits also backtrace to Andy's Solar-bugs: Make a Joule Thief. Both sites have also other interesting stuff available here and here. Long ago I began thinking about how we could illuminate our rooms when they're finished. Of course, since I'm a science geek and care about environment, I immediately thought of lighting up using LEDs. My only problems on my way to ultimate enlightenment were the still low light yield and the high price of LEDs at that time. Recently these thoughts bubbled up in my mind again and I again began to investigate the possibilities of LED-illumination in my home. It seems, that the output of LEDs has increased in the meantime so that regular light could be replaced easily. But the price for this hasn't lowered that much and I'm unsure if the energy-savings compensate for the initial investigation. Well, the only source for LEDs around here, although Germany isn't quite "here" but at least it's in Europe, I found is www.my-led.de. They even have lightbulb-replacements but I'm not willing to pay up to 60\x80 for a single LED-bulb. And that's just the price if I order 100 pieces at once. Well, they have smaller ones starting at ~10\x80 for white ones but that's still a bit high. If anyone can help me with one of those, please leave a comment and point me in the right direction. I just played Grow Cube and have been surprized, that I could solve it within six attempts using just a sheet of paper for taking notes. Its a combination game, where you place things on the cube one after another. After each placement, some things get leveled up. The various parts also depend on each other, so this is no easy task. Nice graphics and a surprise quite at the end. It lives! As you may have noticed, this blog has been down for some time (around 3 or 4 weeks). This has been because the servers of Freepgs.com had burned down at their hoster. All data and hardware was lost in the incident. Last week the replacement servers arrived and were set up and this week I uploaded my backups, which I luckily created from time to time. I had a few problems re-creating everything which has changed since my last backup but with this entry everything should be restored again. If you find something not working, please let me know in a comment. You all know Nintendo. Well, it has lost quite some ground in the past to Sony's PlayStation Systems and Microsoft's X-Box. In general I'm quite a Nintendo-supporter because they have more of those games which require thought and have gameplay-depth than the other platforms provide. I'm thinking of Zelda and such. Despite that even I saw the coming of the Nintendo DS and the Game Boy Systems with mixed feelings compared to its competitors. But now I can hope again. In the last few weeks I've been reading more and more articles and rumours about the upcoming Nintendo Revolution console and what I read excites me. Like back in the 1980s, when Nintendo invented the father of all of our Joypads, see here for a comparison, it is again up to revolutionize our gaming experience completely. I haven't bought a console platform since the SNES, but the Revolution will be the best candidate so far. Well, Katrina (Wikipedia link, article currently under rapid change) has caused massive devastation in southern US. This is an almost unbelievable human tragedy for all people in that region and has a large impact to the whole world. But I'm still missing some news or articles what ultimately causes the increase in environmental disasters in the last years and decades. No one (at least to my knowledge) has yet combined the effects of global warming on the roots of Katrina. It is well known, although many are still unaware of what that really means for us, that the global warming heavily affects nature and weather. Global warming increases the likelihood of disasters. Global warming is greatly aided by the US' ignorance of environmental protection, see the US and Australia rejection, so in a sarcastic way one can say that the great industry nations are now a step closer on environmental suicide. It's somehow their own fault, although we all have to suffer for those faults. A bit more than a week ago I played Paintball with the people from our company. Yesterday another one organized a round of karting. Was fun too. But my body shape was not entirely appropiate for the strong karts we were driving. For one I did not properly fit into the seat and was shaking around in it all the time and for the other I'm not heavy enough to press the kart onto the ground as the other drivers and I lost grip very often. Thus I was the last one crossing the goal. Today I've a hurting back with a swollen spot which has the size of my hand. If I can choose next time which activity our group should attend, I'll choose Paintball. Whoa, what a weekend. Last Friday I was only minutes before acquiring a new car but I just missed the car-seller. He was in the weekend before I could tell him that I finally got my money from insurance on Friday noon. On Saturday we were grilling and invited a few friends for that. Food was great but much was left at the end. Bought a bit too much, something left for Sunday. Saturday to Sundays night a enourmous thunderstorm was going on around our house. It was like world was going down. Hailing, rain, storm, flashes... full featured of course. Then slowly beginning to settle down and back to normal rain. Going up to check the roof and suddenly out of nothing I thought US was invading us. Enourmous "explosions" on the upper side of the roof, hail returned! I could count our roof tiles breaking just by hearing them shatter. We turned on the lights around the house and saw hailstones lying around with the diameter of a bottle of Coke. Up into the roof again and we were hurrying to put buckets below the spots where the rain was coming in. Great! This storm lasted for another half hour before it completely stopped. The next day we checked our roof from the outside and of course we found several holes with (really!) the size of a coke-bottle's diameter. Luckily everything is (again) covered by insurance. It's now longer than a month since my car has been shortened and I'm still waiting for the money from the insurance company. I badly need that cash to be able to buy a new (well, not completely new) car and be able to drive around on my own again. This weekend my fianc? and I attended a LARP, a live action fantasy role playing game. I was a bit unsure of what to expect at first but during play we had much fun and it went quite smoothly. Of course there were some mistakes or unpredictables on both sides, players and game-leaders, but all in all everyone had much fun. Except for one incident: A neighbour of the castle where everything occoured came by, shouted at us and attacked and injured my fianc� without reason. Pulling hairs and scratching skin is not a gentlemens way of telling "Leave my property!" especially if we AREN'T on his property... We then called the police and went to the hospital for checks. This surely can end in a penalty for this rude farmer. Nevertheless, thanks to the team from Zeitschmiede for this new experience! Just wanted to post a quick lifesign. I'm still here but hadn't the time or mood to post something. The laptop is still on his journey and I'fe been busy searching and evaluating possible new cars. At company the workload has suddenly dropped quite a lot and I have a hard time keeping busy with something to be not bored to death. I try to bring up productive and useful stuff but that is not easy when there is not much to do. This friday the inventory for our new kitchen should be delivered and next week I'll be on vacation again. Tomorrow my Notebook will travel to Targa Support the second time in it's life. The first time the power-connector on the mainboard broke, which made the notebook almost un-rechargeable. That first time the support was quite nice and the whole support-chain was seamlessly and professional. The notebook was back after eight days of travel and everything was working fine. No additional charge required because it still happened in warranty time. This time the display backligt is flickering and warranty time is still applying. I sent the service-request online at about 10am last Thursday and have been called back by Targa three hours latet. We agreed on Pick-Up tomorrow and a service-lag of 8 to 10 days. I don't expect any problems, everyone at Targa was very cooperative and friendly.